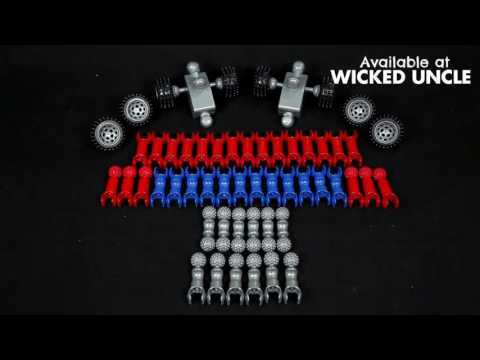 Entertaining and creative 55 piece construction set to make pull back cars to race against each other. The fastback H2H set includes gears, axles and joints that snap, click, and pop together so that you can actually design a working car to race. There are six different designs to make from the Wide Tracker to the Fastback Flyer and comes with 2 pull-back motors and 8 wheels with tyres, so you can either build two cars at once to race one another or create one imposing super-powered machine. Each pull back motor can propel a car up to an impressive 25-feet without needing batteries. Smart. Zooms around, rolls his eyes & snaps up bugs with his long tongue! Crawling Hand - It's Alive! Creepy hand that starts crawling when you make a loud noise - scary! Stikbot ZANIMATION - Create a film! Create animation films with figure & pet dog on your own backgrounds. Since everyone loves surprise presents, there is no need to wait until the next birthday. Zoob Robot kits are great or try a really unusual Robo Chameleon. A Flashing LED hat is very cool.